Global capacity currently stands at almost 570GW, meaning the world could see a 52% increase in just five years, according to GWEC’s analysis. "Opportunities for wind energy to operate on a commercial basis are increasing as the industry continues to prove its cost-competitiveness and bilateral agreements, such as corporate PPAs, grow," GWEC said. Offshore wind and emerging markets will be the key to the rapid expansion, the trade body added, with 40GW of new offshore capacity contributing to the total. China will continue to remain the dominant market, GWEC predicted, accounting for 40% of offshore capacity, and 45% of onshore capacity. However, new emerging wind markets include Indonesia, Philippines, Thailand, Vietnam, Argentina, Colombia and Peru, said GWEC. Karin Ohlenforst, director of market intelligence at GWEC, said: "2018 was a good year for the global wind industry, with installations remaining above 50GW. 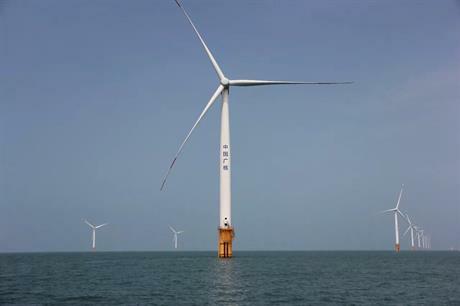 "The dominance of onshore wind power is not surprising, [but] 2018 was also a pivotal year for the offshore industry, particularly in Asia. "If governments remain committed, offshore wind will become a truly global market in the next five years."